Learn how to create your own charts. It is easier than you thought. Just try it today. Here are hand selected professional Excel Products with high quality standards. Please notice that we would never suggest anything that doesn't deserve it! If you are using one of these products and you are not be satisfied, please contact us. We will remove it. For everyone, who wants to create outstanding Charts in Microsoft Excel, the PremiumSlides Charting Kit is mandatory. Anyone managing a project, anyone monitoring a project, anyone tracking and reporting on a project can use these templates and be more productive & efficient in their work. Easy to use Excel Spreadsheet. An easy to understand budget planner that works right in Microsoft Excel (there is no need for additional software). 14,000 copies sold! Create professional panel charts in Excel using columns of data. No programming required, but you can call the utility from your own Excel programs. This is a fully functional barcode add in for Excel. The free code 128 barcode font is included in the Excel barcode add in installer. 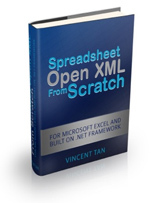 Are you looking for a programming solution to create Microsoft Excel spreadsheets using the Microsoft .NET Framework? Here's the solution! But how can you avoid the costly license fees of commercial code libraries? By simply using the Open XML SDK, a free development kit from Microsoft.